I've been a little lazy as of late, giving myself a little holiday breather, but time to rally as we round the bend into 2011. We welcomed the New Year at Napa. The food was divine, as usual, and they got us in the mood with some complimentary bubbly, but the service was a bit off the mark. Still, fabulous time altogether. As much as I was glad to celebrate, I was sad to read about the passing of Bob Macauley, the founder of Stamford-based AmeriCares. He died in Florida last Sunday at the age of 87. I heard about Mr. Macauley before I moved to Stamford in an amazing news story on his charitable accomplishments. A successful Ivy League educated businessman and veteran, he put his own time and money behind a desperate cause. In April 1975, a US Air Force plane carrying orphaned children out of Vietnam just prior to the fall of Saigon crashed. When Mr. Macauley - who had long supported Vietnamese children orphaned by the war - learned that another plane would not be available for nearly two weeks, he mortgaged his own home to charter a private plane to save the survivors and other children. He airlifted over 300 children to the US. 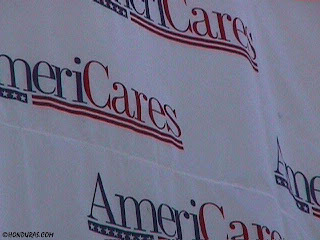 That effort led to others like it and AmeriCares was born. It's now the largest private charity providing health care across the world. The NY Times quoted him from a 1990 interview with the Toronto Star as saying "Someone will always give you nine reasons why it can't be done. Just mow 'em down. Make things happen." That's damn good advice that I hope to follow in 2011.